Members of the families of the crew of AJ-A join with Jan and Macy van Dalen and John Bell of the 617 Squadron Association after the unveiling of the memorial at Castricum aan Zee on the Dutch coast. This was the aircraft piloted by Sqn Ldr Melvin Young on the night of the Dams Raid. It was the fourth to attack the Mohne Dam and caused the initial breach which led to its collapse. The monument was unveiled by Belinda Brown, cousin of front gunner Gordon Yeo, the youngest member of the crew and Geoffrey Sturr, nephew of Melvin Young, the pilot. Two Dambuster daughters. Left, Jill Owen (née Nichols), daughter of Sgt Laurie Nichols, and Angela McDonnold (née MacCausland) daughter of Flg Off Vincent MacCausland. The Young and Ibbotson families in the cemetery in the nearby town of Bergen where the crew is buried. Len and Sandra Brown, representing the family of Charles Roberts. The family of Gordon Yeo. The appeal for funds for a new memorial plaque on the Dutch coast, near where Sqn Ldr Melvin Young’s Lancaster, AJ-A, was shot down on the night of the Dams Raid has been very successful, and has so far raised about 80% of the €3500 needed. The organisers, the 617 Squadron Netherlands Aircrew Memorial Foundation is now appealing to anyone who has not yet supported the campaign to do so as soon as possible so that work can begin on designing and producing the plaque and its associated works. The Foundation was established to commemorate all members of 617 Squadron who lost their lives in the war. As part of this work, the Foundation will unveil a memorial plaque to the crew of AJ-A on the seafront at Castricum-aan-Zee in late May 2018, to commemorate the 75th anniversary of the retrieval of their bodies from the sea and their burial in the nearby Bergen cemetery. Members of the families of the crew of AJ-A have already said that they hope to be present for this occasion. If you haven’t yet made a donation to the Foundation, then this is your chance to do so! Please use the PayPal link below. (Any credit card can be used – you don’t need to have a PayPal account in order to make a payment.) Your donation will be gratefully received and will be acknowledged at the unveiling ceremony. The crew of AJ-A: (L-R) Sqn Ldr Melvin Young (pilot), Sgt David Horsfall (flight engineer), Flt Sgt Charles Roberts (navigator), Sgt Lawrence Nichols (wireless operator), Flg Off Vincent MacCausland (bomb aimer), Sgt Gordon Yeo (front gunner), Sgt Wilfred Ibbotson (rear gunner). For many years a small group of Dutch citizens, headed by Jan van Dalen, have looked after the graves of the Dams Raid crew of Sqn Ldr Melvin Young in the General Cemetery of the small coastal town of Bergen. The crew were aboard Lancaster ED887, AJ-A, on the Dams Raid on 16-17 May 1943, and all seven members lost their lives when they were shot down on their return journey. AJ-A had been the fourth aircraft to drop its Upkeep mine at the Mohne Dam and had caused a small breach. A few minutes later AJ-J dropped another mine, causing the final breach and the dam’s collapse. Young had flown on to the Eder Dam in order to take over command if anything should happen to Guy Gibson on the attack there, but in the event had nothing to do. He then set course to return home and reached the Dutch coast just before three in the morning. Then, out over the sea, he hit disaster when the gun battery at Wijk-aan-Zee fired at the rapidly disappearing Lancaster. At that stage, the aircraft was well past the last gun battery and only a few hundred yards from safety. The battery later reported shooting down an aircraft at 0258, which was almost certainly AJ-A. The wreckage of AJ-A, photographed shortly after the Dams Raid in 1943. Over the next few weeks, the sea yielded up the victims. Part of the wreckage was washed ashore and the first bodies – those of Melvin Young and David Horsfall – floated up on 29 May. They were buried in the General Cemetery at Bergen two days later, and were joined by the bodies of the other five which were washed up over the next thirteen days. The 617 Squadron Netherlands Aircrew Memorial Foundation has now been formally established to commemorate all members of 617 Squadron who lost their lives in the war. As part of this work, the Foundation plans to erect a memorial plaque to the crew of AJ-A on the seafront at Castricum-aan-Zee, which they are hoping to unveil at the time of the 75th anniversary of the crew’s burial in Bergen cemetery in late May 2018. Members of the families of the crew of AJ-A have already said that they hope to be present for this occasion. The cost of this project is estimated to be in the region of €3500-4000. If you would like to make a donation to the Foundation to help pay for the memorial, you can do so using the PayPal link below. (You don’t need to have a PayPal account in order to make a payment – any credit card can be used.) Your donation will be gratefully received and will be acknowledged at the unveiling ceremony. Lawrence William Nichols was born in Northwood, Middlesex on 17 May 1910, and therefore died early in the morning of his 33rd birthday. Nichols was the oldest of the four children of Edward and Florence Nichols. Edward Nichols was a coal merchant. Lawrence Nichols had married his wife Georgina in 1933, and they had two children. He had worked as a haberdasher in Oxford Street and then as manager of a branch of Currys in North Harrow before volunteering for the RAF in 1940. After qualifying as a wireless operator/air gunner he then crewed up with Charles Roberts and John Beesley in 10 Operational Training Unit at RAF Abingdon in July 1942, in a crew skippered by Graham Bower. On 13 September, Nichols went on his first operation, flying with Bower on a raid on Bremen. The crew moved on to 1660 Conversion Unit later that year. On 16 January 1943 , after Bower’s departure, he went on his second operation, to Berlin with Vincent Duxbury as pilot. Melvin Young joined the Conversion Unit later, in early March and took over this new crew there. The full crew were then transferred to 57 Squadron at Scampton on 13 March. On 25 March, they were all reposted to the new 617 Squadron. Nichols was a horse racing enthusiast and had plans to set up as a bookmaker after the war, with financial help from his brother Horace, who was running the family coal business. On 5 May 1943, he wrote to his other brother Gerry, who was serving in the army in India, about their plans: ‘There is no opposition at all in Northwood and I think it would do very well … after all we are very well known and should get plenty of clients.’ He went on to describe to Gerry how he and Horace had cycled over to Windsor to the Easter Monday race meeting. They both backed five winners and also got a successful tip for a race at Pontefract, where they made yet more money. His colleague, front gunner Gordon Yeo, knew well about his betting skills. He told his parents in a letter sent shortly before the crews took off on the raid that ‘Larry (Nichols) our Wireless Operator went to Windsor races last Saturday (1st May) [sic] and won about £12, but he was born lucky.’ Maybe he was, but sadly his luck ran out when he died along with the rest of the crew when they were shot down by a gun battery at Castricum-aan-Zee. 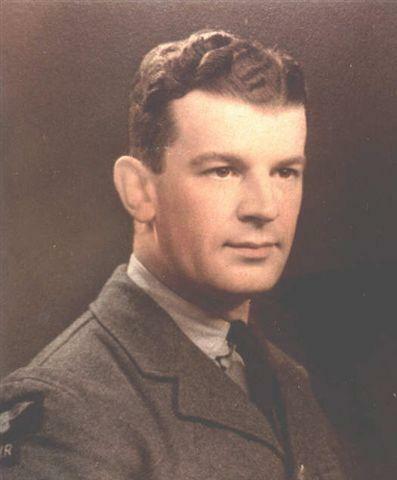 Lawrence Nichols’s body was washed ashore on 27 May 1943, along with those of Vincent MacCausland and Gordon Yeo. They were all buried in Bergen General Cemetery. Further information about Lawrence Nichols and the other 132 men who flew on the Dams Raid can be found in my book The Complete Dambusters, published by History Press in 2018.